In the afternoon of December 15, at Gusuku intersection in Nago, a mongoose boldly crossed a street ignoring cars waiting for the traffic light to change (Photograph provided by Futoshi Hanashiro). 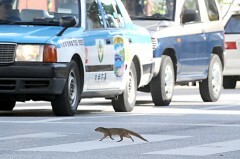 On December 15, a mongoose was seen to cross the street at the Gusuku intersection in Nago. When the light turned green, the mongoose slowly started to cross while looking both ways for oncoming cars. The animal succeeded in crossing the road. Some elementary school students waiting for the traffic light to change were surprised and impressed to see the mongoose carefully cross the street.